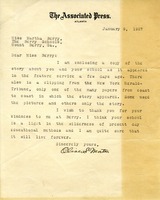 Martha Berry thanks Johm Graham for sending her a clipping and asks that he send her more so that she can know what is going on in New York. She mentions that she saw his family and that several people are coming to visit. She then mentions that she has been thinking about going to New York, but is afraid that she will get sick. 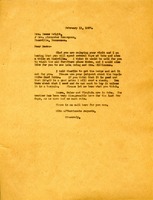 She finishes the letter by thanking him and wishing him a blessed Christmas. Several clippings from newspaper - including one about peafowls for sale. 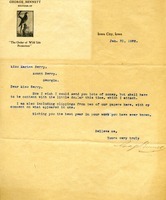 The Berry Schools writes to J. Edmund Hill apologizing for being unable to find the newspaper clippings he wrote to Martha Berry about. Mrs. Roy King mentions finding a newspaper clipping pertaining to The Berry Schools. Mr. Bennett writes about his $1 gift and some clippings he is enclosing. Miss Berry writes Mrs. Wright and Mrs. Bonneyman who are in Knoxville. 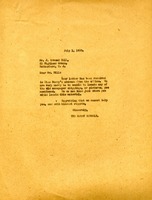 She advises them about purchasing a Hepplewhite card table at a furniture store, and tells them the news from campus. 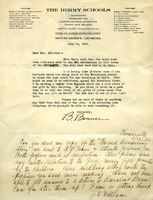 A letter from B. Bonner telling Mrs. Williams that Martha Berry wanted a reference of the 25th Anniversary to be put in the Highlander, as well as having pictures of the barracks that is being constructed be used to garner dormitory funds.